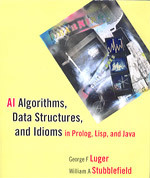 This book illustrates how to program AI algorithms in Lisp, Prolog, and Java. The book basically cover each topic 3 times in each language. Topics include: simple production-like system based on logic, logic-based learning, and natural language parsing. George F. Luger has been a Professor in the University of New Mexico Computer Science, Department since 1979. His two master's degrees are in pure and applied mathematics. He received his PhD from the University of Pennsylvania in 1973, with a dissertation focusing on the computational modeling of human problem solving performance in the tradition of Allen Newell and Herbert Simon.